Today at the NTC Annual Meeting, the Brookings Institution released its highly anticipated study, “From health care capital to innovation hub: Positioning Nashville as a leader in health IT.” [PDF Download] The study presents an economic analysis of Middle Tennessee and Nashville and discusses the great opportunity to leverage the success our region’s healthcare industry by harnessing innovation by applying the advances of software and data analytics prevalent in other industries. At the 2016 NTC Annual Meeting, the Brookings Institution study authors, Mark Muro, Senior Fellow and Policy Director Metropolitan Policy Program at Brookings, and Scott Andes, Associate Fellow Centennial Scholars Initiative at Brookings, both presented their findings [PDF Download] to an audience of more than 300 industry leaders. After the presentation, the Brookings team was joined by Bryan Huddleston, Hayley Hovious, President of the Nashville Health Care Council, and Tommy Lewis, President of the Tennessee Chapter of HIMSS and Senior Vice President Customer Experience at Change Healthcare to discuss a number of the recommendations in the study and each organizations role in working collaboratively to take action. Not on stage on Wednesday but taking an active role in the study’s implementation, were the numerous other industry organizations and the Nashville Area Chamber of Commerce who were vital to the creation of the Brookings report. 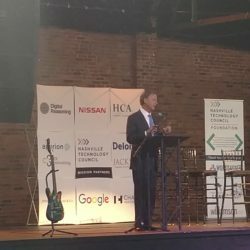 At the Meeting, we were joined by Governor Bill Haslam who emphasized technology’s impact to the growth of our state and was encouraged by the findings and recommendations of the study. 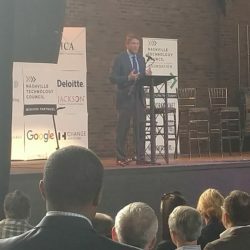 Tennessee Department of Economic and Community Development Commissioner Randy Boyd provided the data to highlight why the Nashville region is primed for the opportunity, and the state is eager to engage. To enable our community to begin the work together, we’ve created the NTC HIT Community and we encourage those interested in the opportunities around Health IT to join. We’ve already announced our first event, too, which is a discussion with the Tennessee Department of Economic and Community Development. We hope to work with you in establishing Nashville at the forefront of healthcare innovation.